I'm new to gear selection, and my question is Ice Axe And Ice Tool the same thing? I like the Petzl Nomic what do you all prefer? No, they are not the same thing. 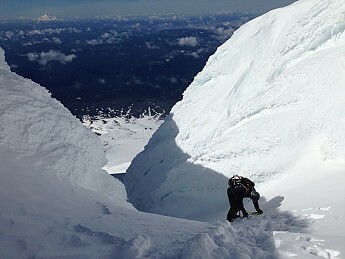 Axes are associated with more traditional routes and terrain, while ice tools are utilized in steep, challenging ice pitches - some what more specialized than ice axes. What is the basis for your preference for the Nomic? Thanks. I like the Nomic because it seems its versatile, and will work on any terrain, and I like the way you pull up with the Nomic. I think I will feel more comfortable with such a device along with an Axe now that you've informed of Axe vs Tool. I'm learning how to Mountain Climb and going to Chamonix next year, and buying and getting gear, and I wanna buy like onetime and that's it. 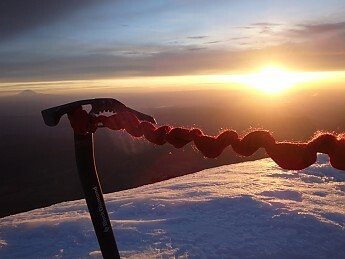 Traditional ice axes, or piolets, are used more like a cane (a third point of contact to help maintain your balance) and in a worst case scenario to self arrest. The steeper the terrain, the shorter the axe should be. A general rule of thumb (for low to moderate slopes, which a beginners course will be) is when standing with your arms at your side the axe should reach roughly your ankles. The more extreme you get the shorter the axe will get, both for the angle of the slope and weight you carry becomes more important. The more aggressively curved shafts (like the Nomics) are designed primarily as ice climbing tools, as you mentioned for pulling your body up (picture a chin up). The curve helps to swing the axe around bulges in the ice and reduces grip fatigue. There is no one tool that is going to excel for both climbing and mountaineering. You're going to sacrifice one way or another. If you can give us a little more info on what activities you want to get into people can give a more informed recommendation. For what its worth the most versatile axe (IMO) is the Petzl Quark. Thanks, I want to get into ALL aspects of Mountaineering, Alpine Climbing and want to attempt the 7 summits. My first attempt will be next Spring in France, and I plan on taking all the courses with Adventure Consultants. Black Diamond Venom is my fav. Its a hybrid (it is slightly bent and has an agressive pick) that is good for mountaineering and steep snow/easy ice. Best of both worlds. I prefer the hammer for placing pickets and then everyone else on the team has the adze (digging) version. If I am alone and need to dig I'll just dig with my shovel or pickett. An ice axe is often referred to as a mountaineering axe to separate and distinguish it from an ice tool. An ice axe is used to assist with the assent, to grab rock edges, cracks, and ledges. It is an invaluable device for stopping a slide or fall.